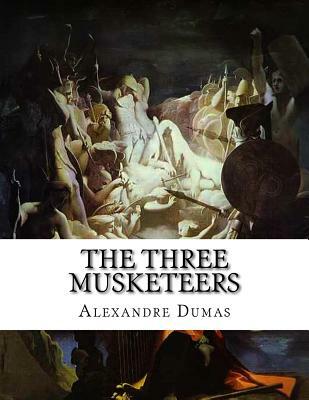 The Three Musketeers (French: Les Trois Mousquetaires ) is a historical novel by Alexandre Dumas, which in its plot has some aspects of an early political thriller. Set in the 17th century, it recounts the adventures of a young man named d'Artagnan (based on Charles de Batz-Castelmore d'Artagnan) after he leaves home to travel to Paris, to join the Musketeers of the Guard. D'Artagnan is not one of the musketeers of the title; those being his friends Athos, Porthos and Aramis, inseparable friends who live by the motto "one for all, all for one" ("un pour tous, tous pour un"), a motto which is first put forth by d'Artagnan. In genre, The Three Musketeers is primarily a historical novel and adventure. However, Dumas also frequently works into the plot various injustices, abuses and absurdities of the old regime, giving the novel an additional political aspect at a time when the debate in France between republicans and monarchists was still fierce. The story was first serialized from March to July 1844, during the July Monarchy, four years before the French Revolution of 1848 violently established the Second Republic. The author's father, Thomas-Alexandre Dumas, had been a well-known General in France's Republican army during the French Revolutionary Wars. The story of d'Artagnan is continued in Twenty Years After and The Vicomte of Bragelonne: Ten Years Later. Those three novels by Dumas are together known as the d'Artagnan Romances.